A. Lorraine Walter, 92, of Claysburg, passed away Wednesday August 15, 2018 at home. She was born September 22, 1925 in Diamondville, WY, daughter of the late Clarence and Laverne (Hutchings) DeMaine. On December 7, 1942, she married the love of her life, Eugene V. Walter in Ogden, Utah. They enjoyed 56 wonderful years of marriage before Gene’s passing on April 4, 1999. She was preceded in death by a brother Clarence, in Utah. She also lost her beloved son-in-law James Gates in 1987, two loving grandchildren Dana Gates in 2001 and Thomas Walter in 1999, and daughter-in-law Diana Walter in 2003. Lorraine was a loving mother to Robert of Alexandria; Wynn Gates and Alan of Claysburg; precious grandmother to Lindy Snider, wife of Robert, of Claysburg, Alanna Walter of Hollidaysburg and Sean and Casey Walter of Claysburg. She attended the Queen United Methodist Church and was a longtime member of WSCS. Lorraine was famous for her cooking and baking. She made many pies for the church and the Imler Fire Hall functions through the years. 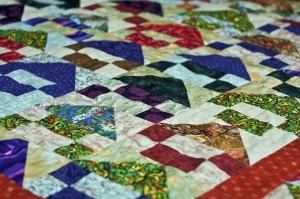 She was also an avid quilter and gave quilts both family and friends. Affectionately known as “Gram”, she was loved by all who knew her. She welcomed anyone to her table, which was always full of delicious food. As she wished, there will be no viewing, but friends will be received from 5:00 P.M. until the 7:00 P.M. funeral service on Friday August 17, 2018 at the Leslie-Miller Funeral Home, Claysburg, Pastor James Neatrour officiating. Private interment at Greenfield Cemetery. In lieu of flowers memorial contributions may be given to the Queen United Methodist Church or the Claysburg Area Public Library.